Enjoy A Tuscan Themed Lunch. The Perfect Party for Summer! — Welcome to Fitty Foodlicious! Last week I was invited to the StarKist Selects E.V.O.O.event in Auburn, California and it was a beautiful way to spend a lovely summer day in beautiful California. StarKist Selects E.V.O.O. 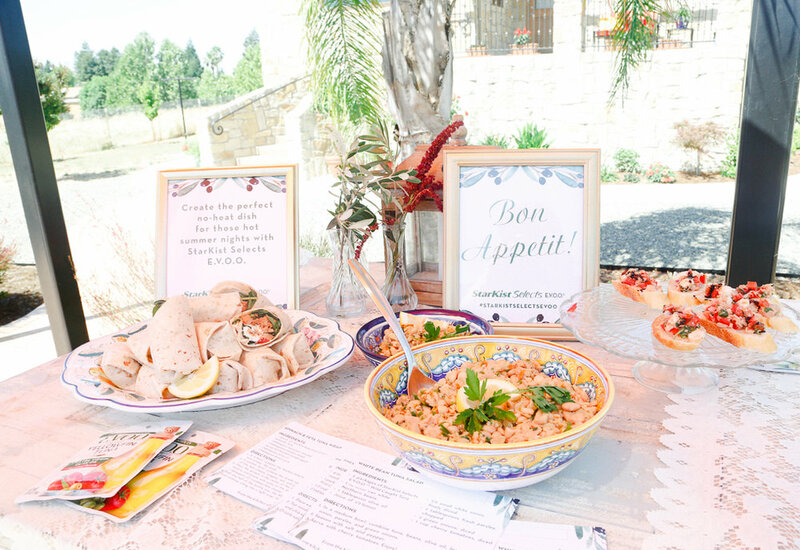 graciously sponsored the event and it was filled with gorgeous Tuscan themed décor and delicious food! Have you guys ever been to a Tuscan themed lunch? It’s really the perfect way to celebrate summer! You can make light, refreshing appetizers, have a soda station, and have gifts for your party guests to take home. It’s easy to inspire your guests with tons of greenery and fresh vibrant colors. One of the best ways to do this, is to incorporate olive branches and fresh, colorful flowers. Peonies and sunflowers is a wonderful option for this! You can also lay out glass votive’s with white candle inside. This works wonderfully, especially if you are having a summer evening party for your closest friends. Gold and silver tones add a touch of pop to the table without anything feeling over bearing. Put out place cards for your guests so that everyone knows where they are sitting. A party just isn’t a party without delicious appetizers. We had delicious bruschetta topped with StarKist Selects E.V.O.O. The recipe came from Coco and Dash and was a delightful treat on a hot day! Did you know that the StarKist Selects E.V.O.O. is made in olive oil and packed in ready-to-go packs? This makes this tuna easy for a quick snack or lunch. StarKist Selects E.V.O.O. is also wonderful for making quick appetizers for party guests like the Bruschetta recipe linked above. Another tasty dish at the Tuscan inspired lunch was Spinach and Feta Tuna Wraps made by the Two Bite Club. These Spinach and Feta Tuna Wraps are a wonderful option for any veggie lovers at your party and are packed with flavor! The new StarKist Selects E.V.O.O. is available in three delicious flavors and each have a very light and mellow flavor to them. They come in Wild-Caught Albacore and Yellowfin tuna, as well as Salmon. Now you can have your salmon on the go in convenient pouches that you can stash in your bag! We had homemade Italian Soda on-hand at the Tuscan inspired lunch, which is a fantastic idea for part guests! There was soda station set up with three different flavors, blue raspberry, strawberry, and orange. All you need to do for this is have some Italian soda flavors on hand, along with some sparkling water. You could even provide everyone with a take-home mason jar, so your guests will be sure and remember your awesome event! Summer entertaining is easy StarKist Selects E.V.O.O. and all of the ideas for an amazing Tuscan themed lunch. Grab some fresh olive branches and fresh eucalyptus for a party your guests will never forget! Comment below and tell me your favorite ways to entertain for summer and let me know what your favorite ways to eat tuna is. Happy summering!